The long winter is over—The Rock Climber’s Training Manual is finally available! If you’ve been waiting for this moment to order your copy, you can do so here. If you’re still on the fence, read some of the feedback the book has received here. It will probably be a while before distribution is set up and the book arrives in retail stores, so ordering online now is likely the quickest way to get your copy. 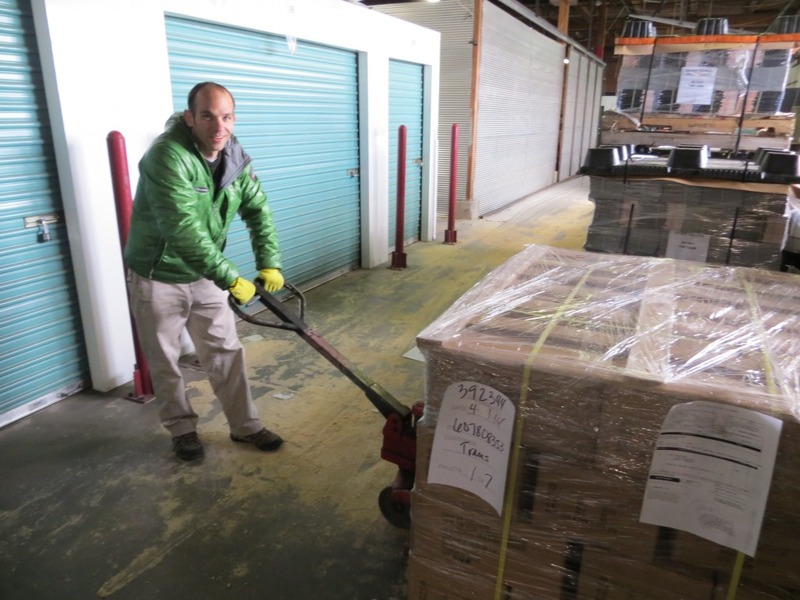 Seven towering pallets of The Rock Climber’s Training Manual arrived in Colorado on Thursday. After work I went up to Fixed Pin Publishing’s storage facility in Denver to see the goods and pick up a few crates of books. The books look great! 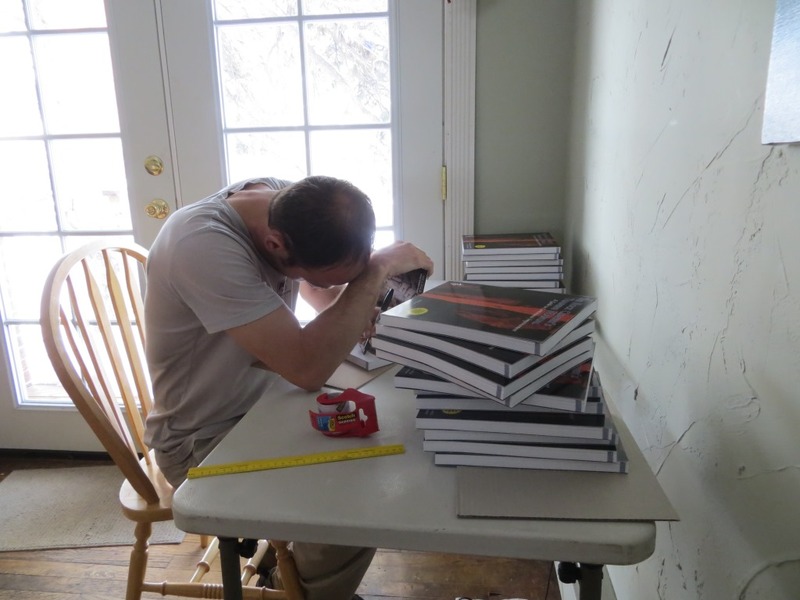 It’s tempting to just sit and flip through it, but we still have a lot of work to do to get the books out to you! 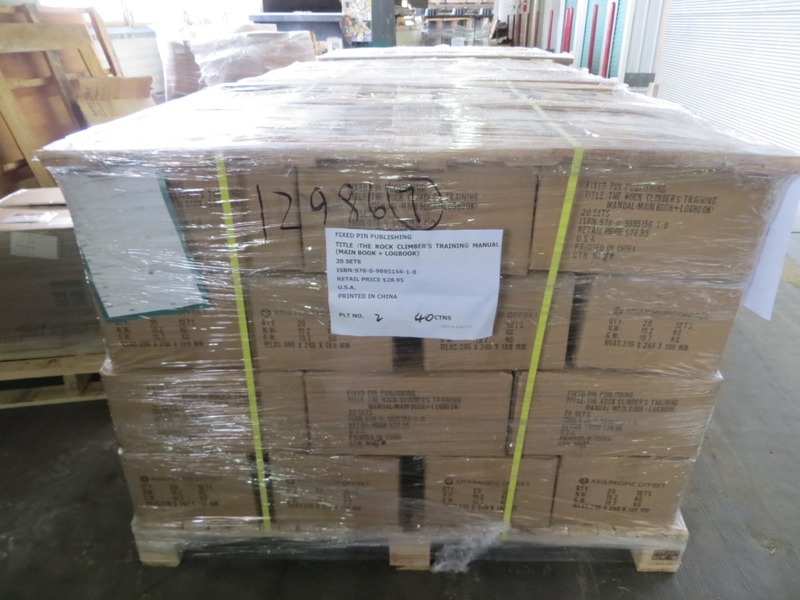 One of seven pallets of The Rock Climber’s Training Manual. Your copy is in there somewhere! Kate has graciously allowed me to convert our living room into a mini-shipping hub so we can get all the books signed, packaged, and shipped. We’re currently in the process of rapidly filling all the existing pre-orders (in the order they were received). I’ve learned more about the US Postal Service in the last week than I ever wanted to know. We expect to have all the pre-orders in the mail by the end of this week, and we will continue process new orders as we receive them. The first batch of books went in the mail yesterday, so some of you should start receiving books any day now. We’re striving to get books out as quickly as we can; it’s a lot of work but it’s really rewarding. We’ve been working on this project for so long, and we can’t wait to get it out to the people we wrote it for. It’s pretty cool to see some of the addresses we’re shipping to; all over the US, Canada, Germany, Belgium, Norway, Ireland, Switzerland… Word is getting out and its very exciting. 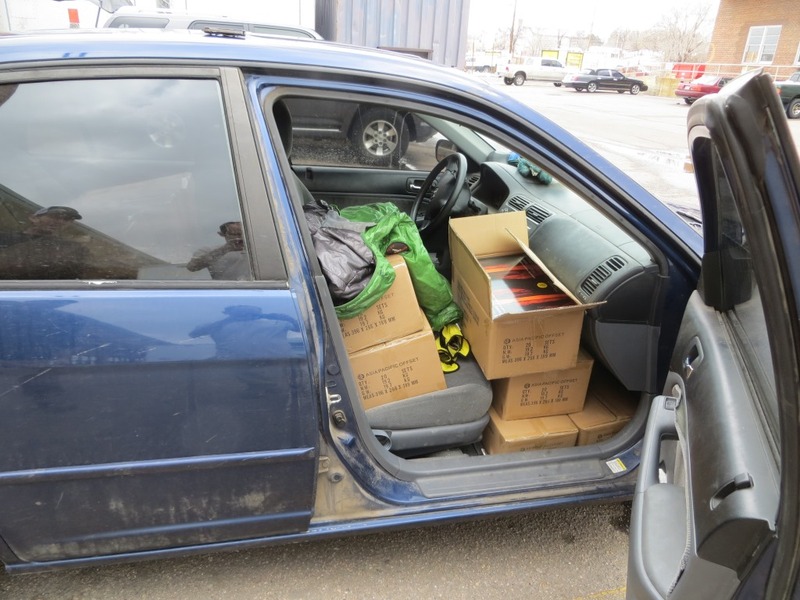 Loading just shy of 1,000 pounds of books into my creaking Honda Civic. To me this feels like the start of a big project—the project of sorting and filling hundreds of orders—but when I step back from what is right in front of me, I realize this event is also the end of a project that’s spanned 18 months. During this time period we’ve spent countless hours researching, brainstorming, writing, reviewing, and editing copy; scheduling photo-shoots, taking, selecting and editing photos; arranging, reviewing and revising layout; arranging for book reviews and marketing our concepts to climbers and media outlets. It’s been a lot of work, and we had a ton of help along the way. Signing books and stuffing envelopes. 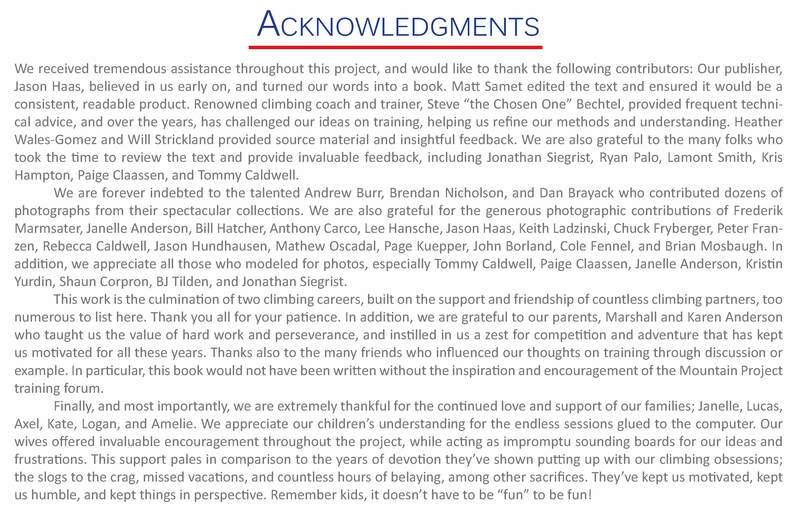 Many people contributed time and resources to help us (see below), but first and foremost, this book never would have happened without all of the folks out there reading this blog. This project was originally conceived by the users of the Mountain Project Training Forum. They gave us the inspiration—and ultimately the motivation—to put our ideas on paper. They, along with my loyal ‘Lazy H Climbing Club’ followers, challenged us daily with questions and discussions that broadened our knowledge and motivated us to keep learning and exploring. We hope you feel like this project belongs to you as well as to us, and hopefully you can join in the modest sense of celebration (and relief) that we are experiencing today. Sometime in the future, when the dust in our shipping hub has settled, perhaps we can get together in person and share a toast to the end of this adventure.